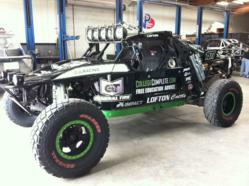 Flat tire, sway bar, not enough to slow Lofton in the desert; California racer drives home to third in the Mint 400 in his CollegeComplete.com entry (877-543-2655). Nothing stops Justin Lofton and nothing should stop you from getting your education. California native Justin Lofton finished third on Saturday in the historic General Tire Mint 400 off-road race in Jean, Nevada. The finish was well-deserved for Lofton and the No. 77 General Tire / College Complete Free Education Advice (http://www.collegecomplete.com) team after they overcame multiple obstacles to score the impressive finish in the legendary event. "To finish third in our class and seventh overall is pretty good after the start we had," Lofton said. "We had a few different battles mixed in there but we still came out pretty good." The "Great American Off-Road Race," Mint 400, which began in 1967, was sponsored by Lofton's No.77 class 1500 unlimited buggy co-sponsor General Tire and is one of the most historic events in off-road racing. With a four-lap run on the treacherous 92-mile course making up the race, Lofton first strapped in on Thursday for his time trials run. Just half of a mile in however, the right rear tire suffered a puncture, forcing Lofton to limp his way to a 23rd place starting position. Once underway for the race on Saturday, the starting spot didn't matter. Lofton got a good jump off the line and got down to business. On the second lap, Lofton had climbed his way to 12th overall, with a seventh place showing in the buggy class. However, under the team's pit stop, some crossed threads with some lug nuts cost them a position. With the event at halfway, Lofton began to notice an issue with his General Tire / College Complete entry, but at the time, he wasn't sure what it was. So, he did what all racers do and kept his focus. Though the dust and slow traffic slowed his drive a bit over the final two laps, he maneuvered his way across the bumpy terrain to finish seventh overall, and third in the unlimited buggy class. "We broke the rear sway bar sometime between the second and third lap," Lofton said. "The car started acting funny but we didn't know what it was. We had a good run with a few hiccups out there. But that's what's great about desert racing, it's so unpredictable." In addition to primary co-sponsors General Tire and College Complete (http://www.collegecomplete.com), who also serves as primary sponsor on his No. 6 NASCAR Camping World Truck Series (NCWTS) Chevrolet, the No. 77 unlimited buggy had support during the General Tire Mint 400 from MasterCraft, Fox Racing Shocks, Fortin Racing Inc., Dougan Racing Engines, and Rusty's Motor Car Inc.
With the Mint 400 behind him, Lofton will return to North Carolina on Monday and ready for the next NASCAR Truck Series race, the Kroger 250, at Martinsville Speedway on Saturday, March 31st.